Pasta Fazool, more formally known as Pasta e Fagioli, is a thick soup made with vegetables, pancetta, pasta, and beans. 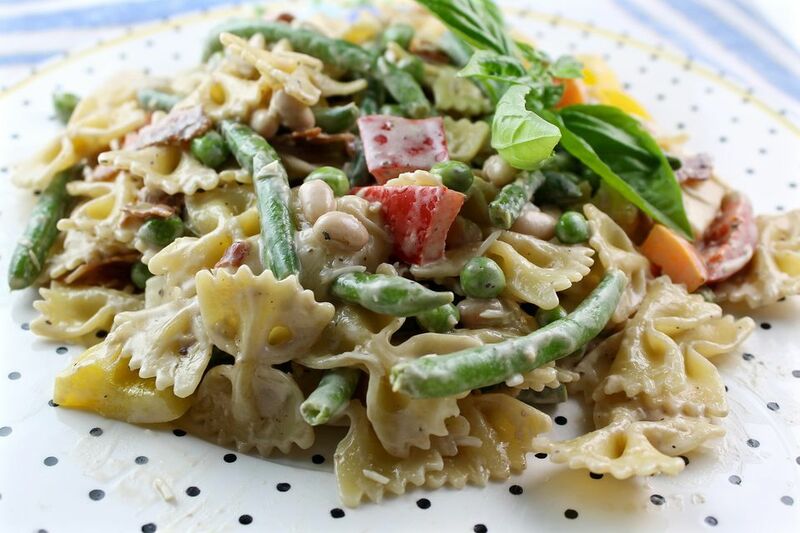 I've turned it into a main dish pasta salad that is cool and delicious and full of flavor. As with all pasta salads, this should be made ahead of time and given a chance to cool and absorb flavors in the refrigerator for a few hours. You can use any vegetables you'd like in this recipe, but try the ones here first. Make sure that the pasta is cooked al dente. It will soften in the sharp dressing as it cools and absorbs some of the herbs and spices. Make sure you have the dressing mixed before you cook the pasta. I like to add hot pasta to salad dressing without rinsing it or cooling it down so it absorbs flavors better. Use your favorite bottled balsamic vinegar salad dressing (I like Newman's Own, myself), or make it yourself from scratch. Make sure it is highly flavored, as all of the other ingredients, especially the pasta and beans, tend to mute flavors. The flavor will also be muted since the salad is served cold. You don't really taste the yogurt in this recipe; it just helps the dressing bind to the ingredients and adds a bit of smoothness. Serve this salad with a glass of cold white wine and some fresh fruit, along with some garlic bread, on a hot summer night. It's superb. In a large bowl, combine the salad dressing, yogurt, and cheese and mix well with a wire whisk until combined. Bring a large pot of water to a boil. Add a handful of salt to season the water well. Add the pasta and stir well; cook until al dente, stirring frequently as it cooks. Drain the pasta in a colander and immediately add it to the dressing in the bowl. Stir in the drained navy beans, green beans, green peas, bell peppers, cheese, and bacon. Mix gently but thoroughly until all of the ingredients are coated. Cover and chill the salad for 2 to 3 hours in the refrigerator before serving.